Ancient Egypt had many remarkable pharaohs. However, one stands out above all others. Ramses II the ‘Great’. A king of kings who is still remembered 3,300 years after his death. A man whose mummy lies in the Egyptian Museum, Cairo, a silent smile playing around his lips, somehow aware that he had achieved the sustaining principle of Egyptian civilisation—everlasting life. Ramses II belonged to the 19th Dynasty during the New Kingdom. He did everything on a grand scale and with enormous enthusiasm. Ruling for 67 years, his reign was one of the longest in Egyptian history. During his opulent rule he waged the famous battle of Qadesh (1285 BC) against the Hittites, signed one of the first recorded treaties in history, sired over a 100 children, and put up Egypt’s largest and most extravagant buildings. A tall man with a mane of red hair, he ate and drank too much and had a huge harem. His favourite wife was Nefertari who appears by his side in most of his monuments. His military fame is, however, largely based on his own boastful words, his accounts of his courageous exploits surviving on the walls of nearly every temple dating back to his reign. Some of his monuments were began by his father Seti I and completed by him, whilst some were completely of his own conception. Amongst the most magnificent of these architectural feats are the Great Hypostyle Hall at Karnak, the Ramesseum, his funerary temple on the West Bank of the Nile at Thebes (today Luxor), the Great Temple of Osiris at Abydos, and the temples at Abu Simbel. After the pyramids, the two rock-cut temples built into the red sandstone cliffs at Abu Simbel are the most famous monuments of ancient Egypt. 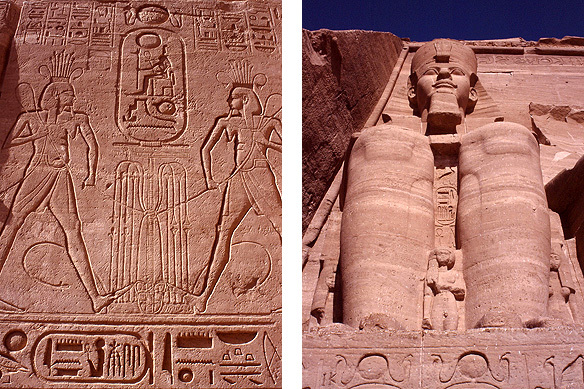 Started by Seti I at a site 350 kilometres from Luxor, they were completed by Ramses II. When the Aswan Dam was built in 1965 and Lake Nasser was created, the raised waters threatened to submerge the monuments on its banks. 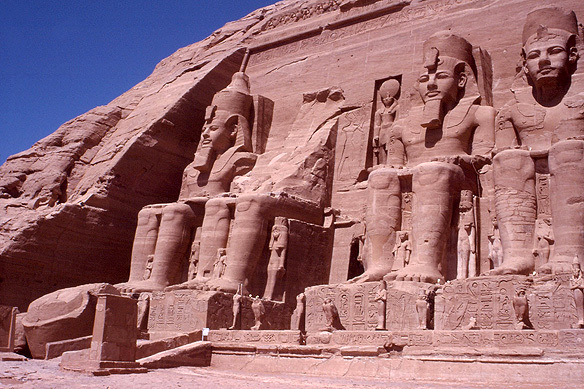 With funding to the tune of US$ 40 million, UNESCO undertook a vast operation to save the temples at Abu Simbel. The temples were hand-sawn into 1,050 blocks and reconstructed on an artificial hill 61 meters higher and 210 meters from the original site. Today, they overlook the vastness of the still waters of Lake Nasser which shimmer like blue silk under the morning sun, silence hanging over the site like a shroud. The facade of the larger temple, the Great Temple of Ra-Harakhte, is flanked by four 20-meter high seated statues of the pharaoh Ramses II himself hewn into the cliff. Scattered amongst the colossi are figures of his mother, his wife Nefertari, and eight of his children. In the middle of the facade is a small statue of the falcon-headed sun-god, Ra-Harakhte, to whom the temple was dedicated to. The sides of the thrones near the entrance to the temple are decorated with carvings of the Nile gods uniting Egypt. Below them on one side is a row of African prisoners and on the other a row of Syrian prisoners. Inside is the Great Hypostyle Hall with four columns on either side, flanked by 10-meter high Osirid (in the Osiris pose—mummified king with arms across the chest) statues of Ramses II. The walls are adorned with reliefs of Ramses II’s campaigns in Syria, Nubia and the Battle of Qadesh. The great hall leads into eight side chambers and the anteroom, which further leads into the inner sanctuary, 61 meters deep inside the cliff. Twice a year, on 22 February and 22 October, the dawn rays of the sun reach into the inner recesses of the sanctuary illuminating the statues within. Adjacent to the Great Temple is the Temple of Hathor which was built in honour of his wife Nefertari by Ramses II. Flanked by six statues of Nefertari and Ramses II, with smaller statues of their children, it is the only temple in Egyptian history that has a woman portrayed at its entrance. The temple is dedicated to Hathor, cow-goddess of music, love, joy and dance and the wife of the sun-god during his day’s passage and mother of his birth at dawn. The hypostyle hall contains columns with hathor-headed capitals. The walls of the hall and inner sanctuary are decorated with reliefs of Nefertari watching her husband killing his enemies and the royal couple paying homage to deities. No trip to Egypt is complete without a visit to Abu Simbel. Its beauty and grace are a reflection of the high point of Egyptian civilisation when the New Kingdom was at its zenith. In half a day the quietness and scale of the monument takes one back 3,300 years. The temples, like the rest of ancient Egypt’s magnificent monuments reflect our very own humanity, of what we are as human beings, have been and eventually will come back to, full circle. The most convenient way of getting to Abu Simbel is by an Egyptair excursion which includes return flights, transfers and a guided tour. 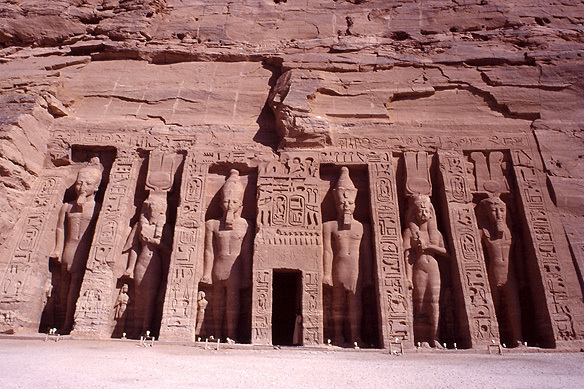 However, if there is time and money, the best way to see the temples is on a Lake Nasser cruise. This entry was posted in Egypt, Exploring our World and tagged Abu Simbel, Ancient Egypt, Egyptair Excursion, Great Temple of Abu Simbel, Lake Nasser Cruise, Nefertari, New Kingdom, Ozymandias, Ramses II the Great, Temple of Hathor, Things to see in Egypt, UNESCO World Heritage Site by Rama Arya. Bookmark the permalink.